Not to be confused with Titan's Treasure or Treasures of the Titans (emphasis on the 's'! ), although treading similar ground to both in its over-sized sandals, is this animated slot from leading developer, Gamesys. Traveling to Ancient Greece - along with about 50 other slots developers who have been there, done that, and got the t-shirt - Gamesys's 5-reel, 100 - yes, one hundred (!) - payline game sees you take on the mantle of a bronzed Bronze Age hero. Already popular on Facebook as a freeplay game, and responsible for some big wins in its land-based version, Treasure of the Titans should be as popular in its real-money online format. Heroes of Greek mythology are the stars here, with Aphrodite and Triton acting as the game's bonus symbols. 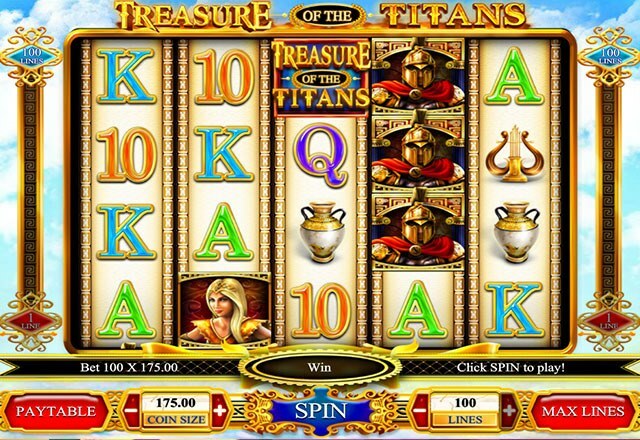 Elsewhere on the reels we get everything you'd expect from a slot on a Greek myth tip: urns, lutes, swords, the Treasure of the Titans logo, our hero and heroine, plus the ancient 10-through-Ace symbols of Greek lore (OK, they're not really ancient, but they are in virtually every other online slot). Triton is the game's Wild and substitutes for all symbols other than Aphrodite's Scatter. Three or more Scatter symbols trigger the Titanic Reels bonus round: players are rewarded with five free spins, and any Wilds (shields) that hit on Reels 2 and 4 expand to become towers that stick for all spins that remain! The remaining reels spin independently to give you more wins. 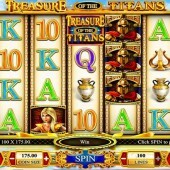 With a nice land-based feel, it's no wonder Treasure of the Titans has been a hit in the casinos. With Facebook slots junkies taking advantage and getting a feel of what the game is all about, there's no doubt Gamesys's online real-money version will be popular too. Free spins, tonnes of pay-lines, expanding Wilds, and a tried-and-tested theme - there's plenty for even the most hardened slots fan. What's not to like? Players that have enjoyed IGT's Greek mythology-themed Treasures of Troy and WMS Gaming's tribute to the Greek God, Zeus, will love this slot.